Chen Xiangmei died last week at the ripe age of 94. If you were trying to fathom all of the hell breaking loose in Washington and the rest of the country, you probably were distracted and missed news of her passing. In fact, if it weren’t for an email sent by a friend in Rhode Island that contained a link to her obituary, I might have missed this news as well. 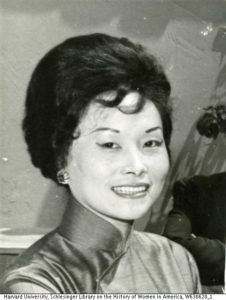 Chen, known in this country as Anna Chennault, died in her penthouse apartment at the Watergate complex in Washington. That’s right. The Watergate. As I read her obituary in the New York Times, it reminded me of so many things about her that are fascinating, including an experience I had nearly 35 years ago in China, the land of her birth. 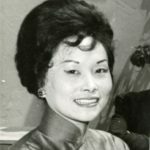 In his email, my friend, who was my roommate when we were privileged to study in two Chinese universities as Fulbright Scholars, asked if I could remind him of an obscure connection I might have with Anna Chennault, nee Chen Xiangmei. I called him to explain that, yes, there was a Six Degrees of Separation connection, but it was instead through her husband, Gen. Claire Chennault, who headed the Flying Tigers contingent that fought the Japanese during World War II. That Chennault connection was initiated, appropriately enough, in China. 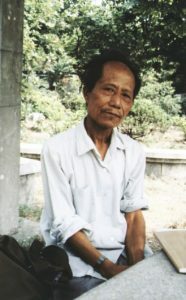 As he spoke a few more words, it was clear that his English was so much better than my Mandarin. Soon, I realized that he had chosen me to be the conduit for some information that he wanted others to know about, and we agreed to meet again in a park after my classes. My new Chinese friend, whom I will call Lin for this article, asked that I not reveal his name; though he is probably deceased by now, I am still honoring my pledge to him. Another ground rule he established was that I couldn’t take any notes during our conversations since we were in a public park, and he was wary of being observed by state security. Lin told me that under the new policies of Deng Xiaoping, Chairman Mao’s successor, he was being “rehabilitated” after serving 19 years in the Chinese version of the Gulag for supposed “anti-state activities.” Part of his problems during the Mao era, he said, were caused by the many close contacts he maintained, past and present, with Westerners, including that famous American, Claire Chennault. As a young man in the early 1940s, Lin told me, his knowledge of English was such that he worked as an interpreter on Chennault’s staff and maintained contact with the general and his associates during and after the war. With regard to the leader of the Flying Tigers, Chennault divorced his wife and in 1947 married the much younger and exotic Chen Xiangmei. During what turned out to be a three-week long interview, with almost daily meetings, we talked about a wide range of other topics, including the developing rapprochement between our two countries, the deep resentment the Chinese held for Japan as a result of its brutal WW II occupation, and how he was able to receive world news in a communist country. As a testament to what the Chinese political climate was like in the 1980s, I asked him several times to come and enjoy the relative comfort of my dorm room to continue the conversation. Lin declined, saying that my room was probably bugged by, you guessed it, state security. Lin – June 1984, Beijing Photo provided by the author. In retrospect, although Lin and I talked several times about Chennault, I never did air my misgivings about the general’s wife and her political activism that developed after the death of her husband. Her obituary is important reading, however, because it brought up a notorious episode that needs to be recalled because of its uncanny connection to present-day developments. The full extent of Anna Chennault’s efforts at sabotaging the Paris Peace Talks that were held to end the Vietnam War was revealed only in the last several years when tapes of Lyndon Johnson’s phone calls and notes from other Nixon operatives like H. R. Haldeman clearly demonstrated Nixon’s treachery. Foreign funds being funneled secretly to the Republican Party. A Republican intermediary in communication with representatives of a foreign government discussing information or action that might help to manipulate the results of the upcoming election. Wiretaps placed by the FBI that pick up conversations of American citizens in contact with representatives of a foreign government which center on scenarios that can influence voting results. Again, what year was this? In the last several months, we have seen reports of foreign funds in the form of Russian money being sent to the NRA for ultimate transmission to the Trump campaign. We also know about the notorious June 2016 meeting in Trump Tower between Donald Trump Jr., Jared Kushner, Paul Manafort and several presumed representatives of the Russian government. Then there is the flap caused by Trump campaign aide Carter Page’s conversations being picked up as a result of a FISA warrant. Sadly, Parry, whose groundbreaking investigative website, Consortium News, also chronicled the 1980 October Surprise and the purported collusion (or treason) between the Reagan campaign and Iranian operatives, did not live long enough to update us more about Anna Chennault. A premier award-winning investigative journalist, Parry died in January at the age of 68. At some point, we might learn even more about Anna Chennault and the pivotal role she played 50 years ago on behalf of a Republican candidate as she colluded with a foreign government to influence an American presidential election. That does sound kind of familiar, doesn’t it? After all, it was Nixon himself who referred to her as the “Dragon Lady”, an off-handed way of recognizing her power and importance in GOP politics. There’s another nugget in this story. How ironic that a “steel butterfly,” Richard Nixon’s Dragon Lady, would live, entertain, and take her last breath in the Watergate. But the irony runs deeper. In an article several years ago, conservative commentator George Will made the point that Anna Chennault and her collaborators, through their actions on Nixon’s behalf in 1968, actually helped to birth the notorious Plumbers Unit that led, inevitably, to the Watergate burglary. When Anna Chennault died last week at the age of 94, the world lost one of the most influential powerbrokers it had never heard of. In reading Anna Chennault’s obituary and thinking about a Six Degrees connect through knowing one of her husband’s WW II colleagues, I’ve also been provided an opportunity to go through Lin’s writings and notes to see what new insights might be found in a small trove of material found in a filing cabinet that contains otherwise obscure artifacts of an exhilarating experience involving study and travel in China, the world’s oldest continuous civilization and most populous country on earth. It all started with a chance encounter outside a classroom at Beijing Normal University in 1984. There, my friend Lin provided me much food for thought, with tales about a general named Chennault and the complexities of international relations. The recent death of the general’s widow at the Watergate and her role in colluding with a foreign government in an American election could not provide a more poignant model for us as we attempt to understand what happened in our last election and what we need to discover so it does not happen again. For those of us who really want to get to the bottom of the current version of the treason or collusion which some pundits call Russiagate, let us remember the role of Anna Chennault, the steel butterfly and doyenne of the Watergate, the most influential powerbroker we’ve never heard of, as an important history lesson and learning exercise. As for me, I also need a learning exercise. I’m determined to go back into a filing cabinet and reread a bulging folder filled with yellowed and odd-sized Chinese paper, knowing that Lin will also help me better understand the present through remembering the past. For that matter, so will Anna Chennault. Speak, memory.